This is the third publication of the outcomes of head and neck cancer surgical treatment in English Hospitals. It reports on the patients who were diagnosed with cancer after 1st November 2012 and before 31st October 2014. As before, these outcomes are drawn from the data collected for the Data Audit for Head and Neck Oncology (DAHNO). The term cancer refers to any malignant tumour. The term malignant usually means that the tumour can form secondaries elsewhere in the body away from the original, or primary, tumour site. Although the term benign tumour means that it does not form secondaries away from the primary site some benign tumours can become malignant, or their growth at the primary site, such as in the brain, may cause the patient’s death. In addition there are some tumour types whose behaviour ranges from benign to malignant depending on their histological grade. DAHNO only included data on tumours that were malignant. Head and neck cancer affects the most socially important part of our bodies. We speak, we eat and drink, and we observe and listen to others through our throat, mouth and face respectively. Furthermore, we use our facial muscles to express ourselves and our facial appearance is a representation of our identity. Head and neck cancer or its treatment may adversely affect all these aspects of our lives and even destroy our sense of ourselves. The words head and neck are a bit misleading because brain, eye, skin and thyroid cancer are dealt with separately and not included in the head and neck cancer group. Even so the head and neck cancer grouping is diverse enough and very heterogeneous unlike other cancer sites such as breast or colon. The many subsites of head and neck cancer are very different anatomically, physiologically and functionally. This variety, and the social aspects of head and neck cancer mean that many clinical groups contribute to the overall management of the head and neck cancer patient. The front of the mouth (oral cavity) which itself includes the upper and lower jawbones, the inside of the cheeks (buccal), the mouth floor (stretching between the tongue and the gum fixed to the inner aspect of the lower jaw behind the teeth), the gums overlying the upper and lower jaws, the front visible part of the tongue (anterior 2/3rds) and the hard palate which is bony hard, fixed and immobile. The sinuses. These are the air sacs in the hollowed out bones adjacent to and above the nasal passages (the maxilla, ethmoids and frontal sinuses). In normal life these sinuses help warm and moisten the air we breathe. The glands that produce saliva. There are multiple very small salivary glands throughout the mouth and throat and 3 pairs of large glands on each side. One pair under the skin in front of the ear (parotid glands); one pair under the lower jaw at the back (submandibular glands); and one pair under the tongue (sublingual glands). The cancers that occur here are mainly adenocarcinomas. The first place that head and neck squamous cell carcinomas spread to (secondaries also called metastases) is the neck glands. There are other less frequent types of malignancy affecting the head and neck such as mucosal melanoma and sarcoma. Sarcomas are rare and are treated in a very few centres where all body sites of sarcoma are treated. They have never been reported in DAHNO. The main treatment modalities for head and neck cancer are surgery, radiotherapy and chemotherapy. New immunological agents and antibodies are being developed and introduced as adjunctive treatments. Approximately 2/3rds of patients will be treated with radiotherapy or chemoradiotherapy either as primary treatment or as adjunctive treatment after surgery. The audit has always only concentrated on surgical treatment. Historically, DAHNO focused on surgical treatment used as the first option to treat the patient and the immediate results of this treatment. The two previous Consultant Outcomes Publications (COP) only evaluated surgery when it was the first treatment and did not evaluate surgical treatment after prior radiotherapy or chemotherapy, or surgery for recurrent disease. It only reported on malignant cancers. The DAHNO national registry was founded over 14 years ago by the British Association of Head and Neck Oncology (BAHNO) (website details), led at that time by Prof John Watkinson, an ENT surgeon in Birmingham. BAHNO set out to create an audit or register of the practice of head and neck surgery around the UK in terms of the number of hospitals and surgeons who were treating head and neck cancer, and how they investigated and treated their patients. BAHNO then used this information to set standards and guidelines (reference). The wider National Health Service (NHS), which had been documenting cancer incidence and prevalence through its regional cancer registries for over five decades, then set up and funded national audits. Therefore, in 2004 the DAHNO audit, funded initially by The Health Care Commission of the NHS, commenced in earnest along with one other national cancer audit examining Lung Cancer. It was restricted to data collected from England and Wales. Over the next 10 years DAHNO was run by the NHS Information Centre (then called the Health and Social Care Information Centre – HSCIC - till this year, when the name was changed to NHS Digital) with clinical leadership by 2 surgeons. Slowly but surely over the next 10 years DAHNO gained increasing buy-in and commitment from hospitals and NHS trusts who provided administrative support for the multidisciplinary teams (MDTs) in the form of MDT coordinators. Therefore, after a rather low take-up, estimated at one quarter of the incident cases in the first annual report, the involvement of Hospitals and Trusts improved significantly so that the 10th annual DAHNO report estimated 92% of patients captured. Although the system of collecting data for DAHNO at weekly Multi-disciplinary meetings - MDTs (when all the interested professional groups managing head and neck cancer should be present) seemed logical, unfortunately, with a few notable exceptions, it relied on the least clinically experienced member of the MDT – the MDT coordinator – to collect and record the data at that time. Furthermore, in order to complete all the fields of the dataset on every patient, these MDT coordinators spend the whole week after the weekly meeting searching through their hospital’s computer networks for pathology and radiology reports, clinic letters and discharge summaries, then interpreting these documents to complete fields on for example, cancer staging, clinical treatment and treatment outcomes. This system of one single person being responsible for completing the data fields made some sense as the HSCIC only needed to liaise with one person at each hospital. Unfortunately, very few if any of the clinical groups actively participated in recording data relevant to their activity believing that this responsibility lay totally with the MDT coordinator. Therefore it is not surprising that although pretty well every head and neck cancer patient is now entered into DAHNO most of these records are incomplete; for example, less than half of the operation records had a record of which surgeon performed them. The HSCIC and DAHNO’s clinical leaders collected the overall raw DAHNO data from each hospital / NHS Trust once yearly after 1st November. Linkage with other data collections held by the National Cancer Registration Service - NCRS (now called the National Cancer Registration and Analysis Service - NCRAS) and HSCIC itself was used to check and augment the DAHNO data. For instance, these data collections were used to check that all new cases of head and neck cancer for the treatment period had been captured by DAHNO (case ascertainment) and that a consultant surgeon’s name was attached to each surgical operation. In addition, the data was sent back to the respective hospitals cancer managers and MDT leads / coordinators. The surgeons and their MDT Leads were given a period of 7 weeks in the first COP, then 12 weeks in the 2nd COP to correct mistakes and augment data fields that were empty (e.g. surgeon/operation fields). Appendix 1 of the 2nd COP report included a clear statement for each NHS Trust showing the number of operations that could not be linked to a surgeon. Some individual surgeons performed heroic efforts over the 12-week window to ensure that every operation could be linked to a surgeon in their Trust. This occurred in 21 out of 94 Trusts. Conversely almost 60% of operations could not be linked to a surgeon in 18 out of the 94 Trusts. Data completeness issues should be factored into any reading of the analysis. Please note that this list is not intended to be a definitive list of head and neck cancer surgical hospitals. Surgeons, who were given seven weeks to update data onto the system, supplemented information for just under half of these procedures (3409 of 7195, or 47 per cent). Some organisations had difficulties or were unable to supplement data about their activity. This should be taken into account when interpreting the data. Due to the relatively low number of these specific procedures undertaken by each surgeon an increase in one or two deaths can have a large impact on the surgeon’s mortality rate. It is essential to maintain a balance between transparency and patient confidentiality in respect of publishing information. This is especially important when releasing data where there are very small numbers. In order to protect patient confidentiality, we have put controls in place to limit the level of information disclosed. For some surgeons this greatly limits the utility of the data. In July 2015, the Health Quality Improvement Partnership (HQIP) (www.hqip.org.uk) on behalf of NHS England and the Welsh Government awarded the prospective national head and neck audit contract to the surgical research charity, Saving Faces–The Facial Surgery Research Foundation (www.savingfaces.co.uk), who were working in collaboration with BAHNO. The technology partner for this new head and neck audit (HANA) is Dendrite Clinical Systems (www.e-dendrite.com) who run many other national and international audits funded by the individual national specialty organisations. Two particularly relevant audits run by Dendrite are the UK National Flap Registry (uknfr.e-dendrite.com), recording the outcomes of reconstructive surgery in the United Kingdom, and the Thyroid and Parathyroid Surgery Registry (https://cl2.n3-dendrite.com/csp/baes/frontpages/index.html) on behalf of the British Association of Endocrine and Thyroid Surgeons (BAETS). This consortium continued the work performed by the HSCIC whose contract finished on 31 October 2014. Although analysing historic DAHNO data for the period before 1st November 2014 was not part of the original tender and bid, HQIP asked Dendrite to take on the generation of the 2013/14 COP as HSCIC had declined to produce this report on the data they had collected and held. All the historic DAHNO data covering the 2013/14 data period was still held by HSCIC so it was necessary for this data to be transferred to Dendrite before any analysis could take place. But first Dendrite had to obtain permission to use patient identifiable data without consent and therefore demonstrate to the Confidentiality Advisory Group (CAG) of the NHS research arm that satisfactory information governance systems were in place before the NHS would agree to Dendrite receiving this identifiable patient data from HSCIC. We gained this approval on 15th September 2015. This turned out to be only the first step in the data transfer. We then had to negotiate the HSCIC Data Access Request Service (DARS) and seek approval from HSCIC before they would transfer any data. Without this transfer no COP analysis could be conducted by the HANA team. We did not obtain any DAHNO data from HSCIC for six months till January 2016. Even then, the data transferred from HSCIC had been stripped of any linked Office of National Statistics (ONS) mortality or Hospital Episode Statistics (HES) data. Our original application was reviewed several times by HSCIC who implement a multi-stage checking process even before their Data Access advisory Group (DAAG) review of the application. At each stage we needed to revise our application and DAAG have now requested that Saving Faces demonstrates that Saving Faces has appropriate system level security. This has resulted in 2 alterations to the reported measures in COP 3 compared with the previous two COPs. Less than 40% of the records received from HSCIC had a surgeon name associated with an operation. We are therefore reporting at hospital rather than surgeon level. Without ONS linkage we have not been able to report on patient mortality within 30 days of surgery, but we have been able to report on whether a patient died in hospital after a surgical operation. COP 2 reported on 2 years of DAHNO data. One of those years is included in both COP 2 and our COP 3 – 1st November 2012 to 31st October 2013. After filtering the DAHNO data received from HSCIC to exclude ambiguous and unreliable data we identified 5,594 surgical records for analysis. However, this number was only around 80% of the number of cases (6,830) that were included in the 2nd COP report. This confirms that our COP 3 report is likely to be less comprehensive than the COP 1 and 2 reports and must be interpreted with even more caution than the authors of the COP 1 and 2 recommended. As was mentioned in the 2nd COP report surgeons and hospitals were given 12 weeks to improve on the raw DAHNO data for their hospital. This COP 2 report was delivered in November 2014, twelve months after the original DAHNO data had been collected. Although we have only been working on the data we received from HSCIC for 7 months, COP 3 is already 8 months behind in the reporting cycle. Therefore, we cannot offer this period of 12 weeks but have settled for a lesser period of time to allow hospitals and surgeons to review and adjust their data if they wish to improve its accuracy. We recognize this is doubly challenging as several surgeons will have left the hospital or stopped performing cancer surgery, new surgeons for whom the data is not relevant will be in post and some of the data is on patients who were treated almost 4 years ago. In summary this COP 3 report has been conducted on data between 2 and 4 years old from a database not designed by HANA, with data not collected by HANA at source, and delivered by the previous contractor without valuable linkage data. Several of the current surgeons working in the hospitals were not there when this data was collected. However, although the data for COP 3 is likely to be incomplete we believe that the 6 fields reported on provide enough valuable information for patients, hospitals, clinicians, commissioners and the NHS to make publication worthwhile, although the data must be interpreted with care. We will report on 3 fields for NHS Choices and MyNHS and 6 fields will be displayed on the COP 3 2016 Web Portal. The results refer to 5,594 operations which were performed between 1st November 2012 and 31st October 2014 on patients who had a single tumour in the head or the neck, and a had single operation recorded as part of their treatment. Results are published only at hospital level. A drop-down list of hospitals that perform head and neck cancer surgery is available, from which an individual hospital can be selected. If the name you type is not found, it is likely that the hospital does not perform head and neck cancer surgery, or did not contribute data to the audit during the study period. Either insert a relevant postcode or type in the name of your local town/village. Press 'search by my postcode' and this will load a map showing your location and surrounding hospitals which can be linked to the Consultant Outcomes Publication data. Clicking on the blue hospital icon will link directly to the relevant data. If your local hospital does not appear, it is likely that the hospital does not perform head and neck cancer surgery or did not contribute data to the audit during the study period. In the 'funnel plots', results within the central area (betweeb the red lines and the green lines) are 'within range' i.e. statistically indistinguishable from the average. Results above the red lines show a significantly higher than expected rate of the outcome in question. The published results are derived from the 2012-14 DAHNO audit data that were transferred from the Health and Social Care Information Centre (HSCIC) to Dendrite for storage and analysis. Data linked by HSCIC to national mortality records and Hospital Episode Statistics (HES) have not yet been passed across. The identity of the operating surgeon or surgeons, which is often derived from HES data, is missing from many of the records. Therefore, in most cases, surgeons have not had an opportunity to check whether data are correct. Hospitals taking on more complex cases might therefore be expected to have a higher complication rate, even if their performance is as good as or better than the average. The focus given to this topic by multi-disciplinary teams has raised the levels of submission of risk adjustment variables, but further work is needed to achieve the levels required to carry out a meaningful risk adjustment. This remains an important goal for the Head and Neck Cancer Audit (HANA) in the future. Even when the overall risk of an audit outcome is known, the prevalence observed in individual hospitals will be prone to some random variation. Statistical methods can help identify whether or not the observed variation might be expected by chance alone. Comparisons between hospitals can be shown in the form of a 'funnel plot', as in the example below. Each hospital is represented by a 'dot', showing the number of cases treated and the corresponding percentage of those cases having the feature in question. 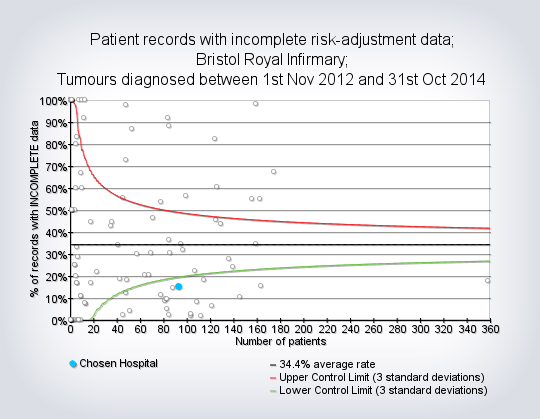 The black line shows the average incidence rate for the whole group of patients (across all hospitals). Results within the central funnel (between red and green lines) are considered 'within control limits' i.e. not statistically significantly different from the average. Results outside the central funnel are very unlikely to have arisen by chance alone, if the hospital's performance were truly average. Other reasons are more likely to explain such results. These might include inaccurate data entry and differences in measuring, as well as poorer or better hospital performance. The British Association of Head & Neck Oncologists remains committed to using its national audit data to improve the quality of information available on surgical outcomes, and to help contribute to professional development of its membership. This website represents one facet of this process. The National Head and Neck Cancer Audit (HANA) will also publish comprehensive annual reports from 2017. These will cover a group of cancers that have many common features but also important differences in biological behaviour. They are treated by a variety of treatment modalities depending on the site and stage of the tumour. What is Clinical Outcomes Publication? Clinical Outcomes Publication (COP) was previously known as Consultant Outcomes Publication and is an NHS England initiative, managed by HQIP, to publish quality measures at the level of individual consultant, team and unit level using national clinical audit and administrative data. COP data are based on national clinical audits including the DAHNO Data for Head and Neck Oncology, which was collected and published for 10 years until 2015. COP is part of NHS England’s transparency measures and provides a way of measuring performance against a set of professional standards such as survival rates or length of stay in hospital following a procedure as well as the number of operations performed. COP reports will help to drive forward improvements in care, enabling patients to understand far more about the nature of a surgeon’s work and their recovery after an operation. Who is responsible for running the head and neck COP? After more than ten years, the provision, development and management of the National Head and Neck Cancer Audit moved from the Health and Social Care Information Centre (HSCIC) to the Facial Surgery Research Foundation (Saving Faces), the only charity in the UK solely dedicated to the worldwide reduction of facial injuries and diseases. Saving Faces are working closely with the British Association of Head & Neck Oncologists, a multi-disciplinary society for healthcare professionals involved in the study and treatment of head and neck cancer and with Dendrite Clinical Systems Ltd as our informatics partners. The new contract commenced on 1st July 2015. In early 2017 Saving Faces aim to publish the 3rd Clinical Outcome Publication, which will be based on historical DAHNO - Data for Head and Neck Oncology records that were transferred from HSCIC to Dendrite in January 2015. What is the National Head and Neck Cancer Audit? The National Head and Neck Cancer Audit (HANA) focuses on cancer sites within the head and neck (excluding tumours of the brain and thyroid cancers). The sites most frequently affected are the larynx and in the oral cavity. HANA is a collaborative project that is operated by Saving Faces and the British Association of Head & Neck Oncologists. The audit has been commissioned by the Healthcare Quality Improvement Partnership, on behalf of NHS England and the Welsh Government and as part of the National Clinical Audit and Patient Outcomes Programme. HANA aims to assess the process of care and its outcomes in patients diagnosed with new primary or recurrent head and neck cancer in England and Wales and to improve the quality of services and the outcomes achieved for patients. What are the aims of the Clinical Outcomes Publication? A total of 5,594 operations were performed between 1st November 2012 and 31st October 2014 on patients who had a single tumour in the head or the neck, and a had single operation recorded as part of their treatment. The website shows the centres that performed this surgery and lists the surgeons that currently operate at each hospital. The map facility allows you to search geographically and by postcode. Why are consultant level data not included in the report? The published results are derived from the 2012-14 DAHNO audit records that were transferred from the Health and Social Care Information Centre (HSCIC) to Dendrite for storage and analysis. The identity of the operating surgeon or surgeons, which is often derived from Hospital Episode Statistics, was missing from many of the transferred records and it is not therefore possible to publish consultant level data. Who might find the head and neck COP information useful? Patients may find reassurance that their hospital is participating in a process of professional audit, and may wish to ascertain how often head and neck cancer surgery is performed there. This information may be useful in discussions with a patient's General Practitioner (GP) regarding a referral to a head and neck cancer specialist, but cannot replace the GP's local knowledge. It is not recommended as the sole means for selecting a hospital. GP's and Health Service Commissioners might find the data helpful in supplementing knowledge of local services in head and neck cancer surgery. Hospitals may not be listed if no qualifying head and neck cancer surgery was performed during the reporting period. Surgeons may not be listed if they are no longer performing head and neck cancer surgery at a particular hospital. The published results derive solely from the 2012-14 DAHNO audit records that were transferred to Dendrite by the Health and Social Care Information Centre. Hospitals that are not included in the transferred data may not be listed. Why can I not view all hospital outcomes together e.g. in a table? Expressing results in the form of 'league tables' is very prone to misinterpretation, particularly when it has not been possible to apply a validated statistical model for risk-adjustment to the data. In the absence of risk adjustment, hospitals or surgeons taking on more complex cases might have apparently worse outcomes. Additionally, the completeness of data varies between hospitals and might significantly affect the reported results. The British Association of Head & Neck Oncologists feel that results are better expressed by alternative means, including funnel plots, which allow for improved understanding of a hospitals results within the spread of data. Who stores and owns the data? Data are held centrally by Dendrite Clinical Systems Ltd in accordance with UK Data Protection laws and current stringent Information Governance policies and standards. Data cannot be released without the written permission of the Healthcare Quality Improvement who are the data controllers. The data are used to produce COP and annual head and neck cancer reports. COP reports were first published in 2013 and 2014 showing head and neck outcomes at the surgeon level. The quality and completeness of the available 2012-14 DAHNO audit data records precluded publication at the surgeon level. The data have therefore been used to show local hospital performance compared with national averages. The British Association of Head & Neck Oncologists operates an 'outlier' policy, whereby hospitals whose nationally published outcomes appear significantly worse than expected can be notified and supported to identify potential areas for improvement. Examples of particularly good hospital performance may also be used in national improvement initiatives. In order to protect patient confidentiality, we have put controls in place to limit the level of information disclosed so that individual patients cannot be identified in any published results. Adjuvant Therapy - Treatment used in addition to the main treatment, often referring to treatment after surgery to increase the chance of curing the disease or keeping it under control. Alopecia - Hair loss from the head or body. Alopecia can be a side effect from medication, such as chemotherapy. Anaemia - A condition in which a person’s blood has a lower than normal amount of haemoglobin, which is a protein in red blood cells that carries oxygen. Anaesthesia - This can refer to the method by which you are treated (that is local or general). It can also refer to the fact that you can't feel a part of your skin. If you can feel but the feeling is reduced or abnormal this is called paraesthesia. Antiemetics - Medications used to control nausea and vomiting symptoms; nausea and vomiting are often a side effect associated with chemotherapy. Auriculectomy - Surgical procedure to remove all or part of the ear. Benign Tumour - An abnormal growth that does not contain cancer and does not spread to lymph nodes or other areas of the body. Biopsy - The removal of a tissue sample from a living person to see if cancer cells are present and to determine the exact type of cancer. This is usually done under local anaesthetic and may be an incision biopsy (removal of a small piece usually with stitching the wound), punch biopsy ( removal of an even smaller piece with no stitching) and excision biopsy (where all the lesion is removed). Brachytherapy - Treatment that uses implanted seeds, needles or other material that emits radiation, near or at the site of the tumor, with the objective of maximizing local radiation to the tumor while sparing surrounding tissues. Cancer - The general name for a group of more than 100 diseases in which abnormal cells grow out of the normal controls of the body’s defence systems. Unlike benign tumors, cancers often have the ability to spread to other parts of the body. Carcinogen - A substance that causes cancer. Cell - The basic unit that constitutes organic tissue. Chemotherapy - Treatment with drugs to inhibit cancer cell division and to destroy cancers. Clinical Trials - Studies that use human subjects and are designed to compare different Treatments for the same condition or fur different stages or severity of the same condition They can also be used.evaluate the optimal dosage and safety of a new drug or medical device, and whether the new drug or medical device is an effective treatment. Computed Tomography (CT) - X-ray images of the body taken from different angles; images are combined to make pictures of internal organs. The images provide a cross-sectional view of a particular part of the body. Concurrent Chemoradiation - A type of therapy that uses both chemotherapy and radiotherapy at the same time; this type of therapy is often more effective than using one therapy alone (i.e., chemotherapy) or using the treatments sequentially (i.e., chemotherapy followed by radiotherapy). Craniofacial Resection - Surgical procedure to remove tissue at the base of the skull; may include bones of the face. Cyberknife - Robotic stereotactic radiosurgery is a type of therapy that can be used to administer radiation to the site of the tumor, while minimizing the dosage to surrounding normal tissues. Cytologist - A pathologist with special training examining individual cells or clusters of cells, which can include the diagnosis of diseases based on the analysis of the cells. Deltopectoral Flap - Tissue from the front of the chest and the shoulder that is based near the sternum and can be used to reconstruct areas of the head and neck. Distant Metastasis - Cancer that has spread far from its original location to distant organs. DNA - Deoxyribonucleic acid (DNA) is the genetic blueprint found in each cell that codes for proteins and holds information on cell growth, division and function. A person's DNA may change (mutation) resulting in cancer formation. These changes occur more frequently with advancing age. Dysarthria - Impairment in speech, such as speaking so that the words run into one another (slurred speech) or an inability to pronounce the words clearly. Dysphonia - Voice impairment with symptoms such as hoarseness. Dysplasia - An term used in pathology to refer to an abnormality of development/growth which hs not turned into cancer, but may be liable to in the future. Electromyography (EMG) - A medical test that checks muscle health and the nerves that control muscles. Endoscopic resection - Endoscopic resection can be used in early-stage laryngeal cancer. During the procedure, a surgeon uses a special microscope to get a magnified view of the larynx. This allows them to remove the cancer either with a laser or small surgical instruments. An endoscopic resection is carried out under general anaesthetic, so you will be unconscious during the procedure and won't feel any pain. Oesophageal Speech - After the surgical removal of the larynx, which contains the vocal cords, patients can learn to speak through this alternate technique, which requires swallowing and then expelling air through the oesophagus (the muscular tube that carries food to the stomach) to produce sound.The speech and language therapist will instruct you in this technique. Oesophagus - The muscular tube that carries food and water from the back of the mouth/lower part of the throat to the stomach. Fibrosis - Hardening or thickening of connective tissue, which may lead to functional impairment in the affected areas. Fibular Free Flap - A flap of bone from the fibula (a thin, narrow elongated bone of the lower leg) that can be transplanted along with skin on the side of the calf and used to reconstruct regions of the upper and lower jaws. Fine Needle Aspiration Cytology (FNAC) - A type of biopsy in which a needle attached to a syringe is inserted into a growth or tumor in order to remove cells that are then analyzed under a microscope. Fistula - A hole between two different anatomic structures or between an anatomic structure and the surface of the body. An “orocutaneous” fistula refers to an abnormal opening between the mouth and the skin of the face or neck. This may result from surgery. It should resolve with medical treatment but might need a small surgical operation. Flexible Fiberoptic Evaluation of Swallowing - A technique that uses a thin tube with a camera to transmit light and images from the back of the throat; this technique has been used to visualize and detect problems with swallowing. During this procedure, the camera, on a flexible scope, is placed through the nose and into the back of the throat to watch the flow of liquids while a patient swallows. Fluoride Prophylaxis - Fluoride has demonstrated efficacy in some trials to alter teeth characteristics, which can prevent cavities. Fluoride Treatment - Because fluoride has been shown to have properties such as the ability to build bone, it has been used to treat osteoporosis and other bone diseases. Frozen Section - Tissue is removed from the site of interest, frozen, sliced into a thin layer and placed onto a slide. Later, the sample is evaluated by a pathologist with a microscope. This technique is most commonly performed during a surgical procedure. It is often used to assess the margins around cancer after it is removed. Gamma Knife - A device that applies radiation to a specific point or region, particularly at or near the site of a tumor. Gastrostomy Tube - A tube inserted through the skin and into the stomach; the tube can be used to administer nutrition or medication. Gene - A segment of DNA that contains information that codes for a protein, such as haemoglobin, and for characteristics such as eye color or the likelihood of developing certain diseases. Genetic Testing - Tests performed to determine whether a person has certain gene sequences known to increase cancer risk or the risk of developing other diseases. Genetic counseling is becoming a routine part of the cancer treatment process. It may provide clues as to whether a particular disease may be present in siblings as well as the risk of spread to patients’ offspring. Glossectomy - The removal of a portion of the tongue or the entire tongue. The adjectives “partial” and “total” are commonly placed before glossectomy to denote the extent of tongue removed. “Hemiglossectomy” refers to the removal of half of the tongue. Gray (Gy) - A unit of measurement of an absorbed dose of radiation. Growth Factors - A product that can promote the division of many types of cells. In some types of cancer, an abnormality that causes the overproduction of a growth factor or the overactivation of a growth factor receptor can cause cells to divide and promote the growth of a tumor. Hoarseness - A voice quality characteristic; speaking in a gravely, scratchy or harsh voice. Hormone Therapy - Treatment with drugs that interfere with hormone production, which can kill cancer cells or slow their growth. Hormone therapy may also refer to the use of hormones that are given as pills or liquid to replace the hormones that are naturally produced by a gland that was removed during surgery. Hypernasality - A quality of voice with an extreme vibration of sound, usually heard with the pronunciation of vowels. It commonly results from the escape of air in the back of the throat that leads to an increase of air coming through the nasal passages. Hyperplasia - An increase in the amount of organic tissue that results from cell proliferation. Hyponasality - A quality of voice with a low or insufficient vibration of sound. It is similar to the quality of voice that occurs when an individual has nasal congestion. Hypopharynx - A cavity in the throat that extends between the hyoid bone, which anchors the tongue, to the cricoid cartilage, which is a piece of cartilage that is located at the top of the trachea. The hypopharynx is the portion of the throat that connects to the oesophagus, and food passes through this region en route to the stomach. Hypothyroidism - Caused by a decreased production of thyroid hormones. Symptoms can include fatigue, weight gain or cognitive and/or psychiatric problems. Image-guidance - This type of therapy uses computers and images, which can be collected from CT, X-ray or other techniques, of both the tumour and surrounding anatomic structures. The imaging information is then used to plan the radiation therapy so that radiation can be transmitted to the site of the tumor while sparing the surrounding normal tissues.It can also be used to guide surgical operations. Immune System - The body’s network of cells that work together to protect the body from invading micro-organisms and disease. Immunotherapy - Treatments that promote or support the immune system’s response to cancer. Induction Chemotherapy (Neoadjuvant Chemotherapy) - Chemotherapy, or drugs that slow cell division and cause the death of cancer cells, are used first in a sequence of therapies. It commonly involves several courses of administering drugs prior to the main form of treatment, which may involve radiation or surgery. The cancer’s response to induction chemotherapy will often help to determine the rest of treatment. Infusion Port - If a patient is likely to need long-term and frequent access to a vein, a central venous access device, called a port, can be used. The implantable device will include a tube that inserts into the vein. The port can stay in place for an extended period of time so that samples can be collected frequently from the blood and/or medications such as chemotherapy can be administered. Intensity Modulated Radiotherapy - This type of radiotherapy is used in combination with images that include the shape of the surrounding anatomic structures and the tumors, which enables the application of variable radiation intensities to the site of the tumor while sparing surrounding tissues (and minimizing radiation therapy toxicities). Laryngectomy - Surgery to remove a portion or the entire voice box (larynx - the structure that holds the vocal cords). Laryngectomy Tube - After the surgical removal of the larynx, which contains the vocal cords and a pathway to the lungs, a hole (stoma) is created that involves sewing the end of the windpipe to an opening in the skin of the neck. Tubing is used in combination with the stoma to maintain access to air for breathing. Pharyngolaryngectomy - "The surgical removal of both the pharynx, which is located at the back of the mouth and extends from the end of the nasal passage to the larynx, and the larynx, which contains the vocal cords. This procedure is commonly performed for cancers of the hypopharynx. Reconstruction of this defect requires reconnection of the mouth to the oesophagus (gullet) or stomach. This is usually done using a section of small intestine called the jejunum and involves a separate operation on the abdomen. The trachea is brought to the skin in the front of the neck as an end stoma (hole)or “laryngostome""." Laryngoscopy - If it isn't possible to get a good view of your larynx during a nasendoscopy, or a possible problem is spotted, you may have a further test called a laryngoscopy. Like a nasendoscopy, this procedure involves using an endoscope to examine your larynx. However, the endoscope used during a laryngoscopy is longer and inserted through the mouth. This allows the larynx to be seen in greater detail. Usually carried out under general anaesthetic. Latissimus Dorsi Flap - The transfer and use of a portion of the latissimus dorsi, a large outer muscle on the lower part of the back, for the reconstruction of an area in the head. This muscle is commonly transferred with the overlying skin and can be used either as a regional pedical flap or a free flap. larynx - The larynx or voicebox is part of the throat found at the entrance of the windpipe (trachea). It plays an important role in helping you breathe and speak. Localized Cancer - Cancer that is confined to the organ where it started and has not spread to other parts of the body. Lymph Nodes - Small bean-shaped collections of immune system tissue that remove cell waste, germs and other harmful substances from the lymphatic system. Lymph nodes fight infections and have a role in fighting cancer, but cancer can also spread to or through the lymph nodes. If this occurs, the lymph nodes may need to be removed. Lymphatic System - The extensive drainage network that keeps bodily fluids in balance and defends the body from infections. Cancer often spreads through the lymphatic system. Malignant transformation - The process by which cells acquire the properties of cancer. Malignant Tumor - A mass of cancerous cells that may invade nearby tissues or spread (metastasise) to other areas of the body. Mandibulectomy - Removal of a portion of or the entire mandible, or lower jaw. Marginal and segmental mandibulectomy refer to the removal of portions of the lower jaw. Maxillectomy - Surgical procedure to remove all or part of the maxilla, or upper jaw. Medical Oncologist - A physician who is specially trained to diagnose and treat cancer with chemotherapy and other drugs. Melanoma - A type of cancer that starts with pigmented cells called melanocytes, which are primarily located on the skin but are also found in other parts of the body such as the eye. Metastasis - Cancer cells that have spread to one or more sites elsewhere in the body, often through the lymphatic system or bloodstream. Microvascular Free Flap - This technique of reconstruction revolutionised the surgery and overall decision-making in head and neck cancer treatment. Essentially, it involves microscopic plumbing of arteries and veins from one site in the patient' body to branches of the carotid artery and jugular vein in the patient's neck. The artery and vein from a distance site in the patient's body have been confirmed to supply lblood to and drain blood from arge pieces of bone and or, skin and fat and or muscle. These large pieces of tissue can be removed from their natural sites without undue harm to the patient and used to reconstruct the head and neck. After identifying these tissue materials surgically their artery and vein are divided at their natural site in the body (donor site) and the whole bulk of tissue is transplanted to its recipient site in the head and neck. The artery and vein from the donor site are now joined using fine stitches (anastomosed) to branches of the carotid artery and jugular vein and when the clamps are removed from these blood vessels the mass of tissue comes and stays in alive. A multitude of areas of the body have been identified that have an artery and vein that are vital to the success of the transfer. This surgical technique is challenging and must be performed at specialised centres. Barium Swallow - A test to evaluate problems with swallowing; the patient drinks a barium liquid or paste mixture and fluoroscopy (Xray examination) is performed to record the swallowing. Evaluation of this test helps to understand how well a patient is swallowing and may help to determine the safety of swallowing as well as what technique may be used to help a patient to effectively swallow. MRI (Magnetic Resonance Imaging) - A radiology technique that uses magnetism, radio waves and a computer to produce highly detailed images of structures in the body. M-stage - Describes distant metastasis (spread of cancer from one part of the body to another). M-stage is given as either M0 or M1. Multidisciplinary team (MDT) - Most hospitals use multidisciplinary teams (MDTs) of specialists that work together to decide the best way to proceed with your treatment. Members of your MDT will probably include a surgeon, a clinical oncologist (a specialist in non-surgical treatment of cancer), and a specialist cancer nurse who will be responsible for co-ordinating your care. Nasendoscopy - A nasendoscopy is a procedure used to get a clear view of your larynx. During the procedure, a small, flexible tube with a light and video camera at one end (endoscope) is inserted into one of your nostrils and passed down the back of your throat. The images from the endoscope are displayed on a monitor. Nasogastric Tube - This is a tube that passes through the nose to the stomach If a patient has problems with swallowing, to feed administered liquid diets to the patient. Nasopharyngeal cancer - Nasopharyngeal cancer affects the part of the throat that connects the back of the nose to the back of the mouth. It's one of the rarest types of head and neck cancer in the UK but is more common in the far east. It is ofetn associated with a virus called the Epstein-Barr virus. Neutropaenia - An abnormally low number of white blood cells (the cells that fight infection). No Evidence of Disease - A term that is used when examinations and tests can find no cancer in a patient who has been treated for cancer. Nose and sinus cancer - Nose and sinus cancer affects the nasal cavity (above the roof of your mouth) and the sinuses (the small, air-filled cavities inside the bones of the nose and within the cheekbones and forehead). N-stage - Describes nearby (regional) lymph nodes that are involved. N-stage is given as a number from 0-3. Oncology - The field of medicine concerned with cancer, including diagnosis and treatment. Oral lichen planus - A chronic inflammatory condition that affects the mucous membranes of the mouth. It can appear as white patches, red swellings or open sores. Oral submucous fibrosis - A chronic disease of the mouth most commonly affecting the soft palate (the movable part of the palate at the back of the mouth) and the inside of the cheeks (buccal mucosa). It is caused by chewing paan or betel nut and results in severe fibrosis and difficulty openeing the mouth (trismus). Orbital Exenteration - The removal of the eye and adjacent tissues located in the space within the bony eye socket. Oropharynx - The cavity in the back of the mouth which is the middle part of the pharynx between the nasopharynx above and the larynx and cricopharynx below. The pharynx then leads down to the oesophagus (gullet). Osseointegrated Implant - An implant that will come into direct contact with bone; bone can grow around the implant in order to achieve a stable fixation between the bone and the implant. Following a period of healing, these implants can be used to anchor a prosthesis such as a denture or an artificial nose or ear. Osteoradionecrosis - A disorder that occurs due to radiation and results in the death of bone cells. Osteoradionecrosis occurs in different degrees of severity, which determine the type of treatment that is required. Obturator - A prosthetic device (enalrged denture) used to fill gaps in the upper jaw (maxilla) and palate after operations such as maxillectomy. Palate - Upper part of the mouth that separats the mouth from the sinuses and nose. Palliative Care - Treatment aimed at improving a patient’s quality of life by relieving symptoms such as pain. Palliative treatment is not aimed at curing a disease. Parotid Gland - The largest of the salivary glands, the parotid gland is located under the cheek skin in front of the ear. Pathologist - A doctor who specializes in the classification of cells and disease diagnosis by examining tissue samples under a microscope. Pathology - A branch of medical science primarily concerning the study of organs, tissues and bodily fluids in order to make a diagnosis of a disease. Pectoralis Major Flap - The transfer and use of the pectoralis major muscle, located in the front of the chest wall, for the reconstruction of an area in the head or neck. This is a very commonly used regional flap that permits transfer of chest wall skin by transposing the muscle over the collarbone without interrupting its blood supply. Definitive Pathology - This is the report deliverede by the pathologist after surgical resection. This result takes much longer than the frozen section to come back because the tissue must be specially prepared then every part of the tisuue removed must be closely examined. It may take several days to complete. Personalized Medicine - A term that describes diagnosing or performing medical treatments based on individuals’ unique characteristics, such as their genetic makeup or the specific characteristics of a patient’s cancer. PET Scan - An imaging test that uses a radioactive substance, usually attached to glucose, called a tracer to look for disease in the body. Increased uptake of the tracer is found in cells that are very active such as in infection or cancer. Photodynamic therapy - If the cancer is in its very early stages, it may be possible to remove any tumours using a type of laser surgery known as photodynamic therapy (PDT). PDT involves taking a medicine that makes your tissue sensitive to the effects of light. A laser is then used to remove the tumour. The patient is usually incredibly light-sensitive for up to a week after this treatment and must therefore be kept isolated in a dark room for this time to prevent severe sunburn. Platelet - A component of blood that helps blood clotting and reduces bleeding. Primary Site - The site where cancer originated or first started growing. Prognosis - A medical term for predicting the likely outcome of an illness or form of treatment. Prosthodontist - Specialist with an area of expertise in dentistry and the replacement of missing tissue such as teeth from the jaw and mouth. A maxillofacial prosthodontist will often be involved in the creation of other anatomic structures such as an ear, nose or eye. Proton Beam Radiation - A type of treatment for head and neck cancer that applies radiation in the form of a proton beam to a tumor. Punch biopsy - A punch biopsy may be used if the suspected affected area of tissue is in an easily accessible place, such as the tongue or the inside of the mouth. The area is first injected with a local anaesthetic to numb it. The doctor will then cut away a small section of affected tissue and remove it with tweezers. Radial Forearm Flap - Tissue from the forearm can be removed and then used to reconstruct defects in the head or neck. It is a commonly used microvascular free flap that carries vascularized skin and sometimes bone from the radius. Clinical Oncologist - A doctor who concentrates in using radiation therapy to treat cancer. Radiation Simulation - In order to optimize the delivery of radiation therapy to the site of the tumor while sparing surrounding healthy tissue, a simulation and planning is done; a patient will position himself or herself as if the therapy will be administered, and images, such as a CT scan, are taken. This is part of the treatment planning process. Radical Neck Dissection - The surgical removal of all of the lymph nodes in the neck. The dissected lymph nodes are then evaluated by a pathologist for the presence of cancer. Reconstructive Surgery - Surgery to restore the form and function of the body. Rectus Abdominis Flap - The transfer and use of a portion of the rectus abdominis muscle, a large flat muscle in the abdomen, for the reconstruction of an area in the head or neck. It is commonly transferred to the head and neck as a free flap with the overlying skin located on the front surface of the abdomen. Recurrence - The return of cancer after treatment. Red Blood Cells - A type of blood cell that contains haemoglobin, which carries oxygen from the lungs to other parts of the body. Regional Flap - While there are surgical techniques such as the microvascular flap that must be performed at specialised centres, the regional flap technique is not as complicated and does not necessitate a specialised centre. Regional flap is the use of regional or nearby tissue to replace and repair the missing tissue in the part of the body with the defect. It does not require removal and repositioning in the body, and its vascular supply is maintained throughout the transfer. Regional Metastasis - Refers to the spread of cancer to lymph nodes in the region near the organ where the tumor originated. Remission - Complete or partial disappearance of cancer signs and symptoms in response to treatment. A remission may not be a cure. Respiration - The action of moving air into and out of the lungs. Respiratory Function (and Testing) - To evaluate whether there are breathing problems, evidence of lung disease or airway obsruction, numerous pulmonary function tests can be performed. Examples include spirometry tests, which measure air that goes into and exits the lungs, and the measurement of lung volume. Rhinectomy - Surgery to remove a portion of or the entire nose. Rhinotomy - The use of surgery to cut into the nose, usually to obtain exposure to remove a nasal tumor. Rigid Fixation - During reconstructive surgery, that involves the transfer of bone to the head and neck, plates and screws are often utilized to hold the transplanted bone in position allowing it to heal to the adjacent bone in order to form a solid union. Rigid fixation may also be used to hold segments of native bone in position without placing a bone graft. In this situation, the rigid fixation is designed to replicate the missing part by using a prosthesis without bone. Robotic Stereotactic Radiosurgery - Robotic stereotactic radiosurgery is a type of noninvasive therapy that can be used to administer radiation to the site of a tumor while minimizing the dosage to surrounding normal tissues. Fistula - An abnormal tube connecting the skin with one of the body cavities. An orocutaneous fistula which connects the mouth to the neck skin may occur as a complication after surgery. This is usually managed medically but may require some further minor surgery to repair the hole in the mouth. Salivary Gland - Glands that produce saliva and empty it into the mouth. The main salivary glands include the parotid, sublingual and submandibular glands. There are many minor salivary glands situated all around the mouth and throat. Salivary gland cancer - The main symptom of salivary gland cancer is a lump or swelling on or near your jaw, or in your mouth or neck, although the vast majority of these lumps are non-cancerous. Other symptoms can include numbness in part of your face and drooping on one side of your face. Scapular Free Flap - A donor site located on the upper back that is commonly used to transfer a wide range of tissue, including skin and muscle as well as vasularized bone from the lateral or side portion of the scapular bone. The latissimus muscle as well as the serratus anterior muscle and rib can be transferred as part of this free flap. Segmental Mandibulectomy - The removal of a through-and-through segment of the lower jaw that disrupts the continuity of that bone. This is usually reserved for more extensive tumors than those that are managed by a marginal mandibulectomy. Selective Lymph Node Dissection - Specific groups of lymph nodes that are likely to drain a tumor will be removed and evaluated under the microscope for signs of cancer; notably, lymph nodes that are outside the suspected area in the neck will be spared. Side Effects - Unwanted effects of treatment, such as hair loss, which is sometimes a side effect associated with chemotherapy. Simulation - In order to optimize the delivery of radiation therapy to the site of the tumor while sparing surrounding, healthy tissue, a simulation and planning is done; a patient will position himself or herself as if the therapy will be administered, and images, such as a CT scan, are taken. Sinuses - The air-filled cavities in some of the facial bones that warm and moisten the air we breathe and lighten the weight of our heads. There are 3 sites (ethmoid, frontal and maxillary) They may get blocked and infected (sinusitis) and cancer can occasionally develop here. Skin Graft - A patch of surgically removed skin that is transplanted or attached to another area of the body. Unlike a regional or free flap, a skin graft does not have its own blood supply and relies upon multiple tiny blood vessels growing into the skin graft from the recipient site. Staging - The extent and severity of the primary cancer tumour and whether it has spread. Staging provides a means for doctors to communicate about a patient’s condition as well as a method to group patients with the same disease for the purpose of determining the best treatment and the likelihood of response to treatment. Stenosis (see stricture) - A passage or tube within the body that becomes narrowed in diameter. Stereotactic Radiation - A type of therapy that uses a computer and an imaging device, such as magnetic resonance imaging (MRI) scans, to anatomically localize a tumour within the body. This pretreatment planning ensures radiation will be administered to the tumour but reduce radiation to surrounding normal tissues. During the radiotherapy, a head mask fixation system is used to ensure the patient always receives the radiotherapy to the exact site..
Stoma Cover - After a patient has the larynx removed, a hole (stoma) will be surgically placed in the main windpipe; an artificial device can be used instead of a larynx, which will typically include tubing, a chamber where the sound vibrates and a cover. A stoma cover, typically a fabric bib-like item, helps to keep the stoma clean and healthy by keeping dust and other particles out and warming the air during breathing. Stricture - A passage or tube within the body that becomes narrower.The stricture interferes with the passage of solids, liquids or gases that the tube normally carries..
Stridor - A rough sound that is made during the breathing process, which is caused by a blockage of the airways. Submandibular Gland - A salivary gland that is located under the lower jaw. Submental Flap - Tissue from the front portion of the upper neck located under the jawline that can be transplanted for the reconstruction of anatomic structures, such as the tongue, after it has been removed to treat cancer. Surgical resection - Operation in which cuts are made to remove cancerous tissue and some surrounding normal tissue to ensure the cancer is completely removed. It is also used palliatively to improve patient's symptoms where it may not possible to cure the patient. or reconstruct tissues or anatomical structures. Surgical reconstruction - After removal of head and neck cancers, the patient frequently needs reconstruction to enable successful swallowing, eating, speaking and breathing as well as to restore facial appearance. Reconstruction involves taking varying combinations of skin, fat, muscle and bone from one part of the patient's body (depending on what's needed) and using this to reconstruct the head and neck region. Intensive Care Unit (ICU or ITU) - Patients who need to be evaluated, monitored and medically supported after surgery will stay in this specialized facility in a hospital. Thrombocytopenia - A medical condition in which a person’s blood has a low level of blood cell platelets and may be predisposed to problems with clotting. Tissue - A collection of cells that are united to perform a particular function. Total laryngectomy - A total laryngectomy is usually used to treat advanced laryngeal cancer. The operation involves removing your entire larynx. Nearby lymph nodes (small glands that form part of the immune system) may also need to be removed if the cancer has spread to them. Trachea - A tube that carries air from the larynx, which contains the vocal cords, to the branches of the lungs. The trachea has cartilaginous rings that provide support for this structure. Tracheo-oesophageal Puncture - If a patient has the larynx removed surgically to treat cancer and can no longer speak, the first step to re-enable the patient to have a voice is to surgically create a hole (puncture) in the back wall of the trachea, the main windpipe. The puncture or opening in the back wall of the trachea extends into the front wall of the oesophagus. A speaking valve is then inserted through this opening and permits air to be directed from the windpipe into the esophagus and out the mouth, thereby allowing a patient who is otherwise unable to speak to resume talking. Tracheostomy Tube - The tube that is placed in the surgical opening in the trachea, the main airway in order to help breathing or to allow a connection to an artificial breathing machine as a respirator or ventilator. Trismus - The inability to completely open the mouth, which may be due to muscles that are used for chewing having a decreased range of motion. It may also be caused by the growth of a tumor. Tumour - An abnormal lump or tissue mass. Tumors can be non-cancerous or cancerous. Tumour Grade - How abnormal cancer looks under a microscope. Cancers that appear normal have a low grade, while cancers that have more abnormal-appearing cells and tend to grow and spread more quickly have a high grade. The tumour grade affects prognosis and treatment. Ultrasound scan - This test produces Images (pictures of parts of the body) using high-frequency sound waves . This is performed by laying jelly on the skin then passing a probe over the surface of the skin. A fine needle aspiration of cells may be performedat the same time to take cells for examination (cytology). The needle is the same size as that used for blood tests. .
Videofluoroscopic Evaluation of Swallowing - This type of instrumental assessment is conducted to identify the physiologic swallowing impairment and to determine whether any therapeutic strategies will make the swallow safer (e.g., eliminate aspiration) or more efficient (e.g., improve flow of food and liquid through the mouth and throat); the patient will swallow liquids and solids mixed with barium, which will enable the anatomic structures as well as the barium liquids and solids to be visualized in real-time during swallowing in a scan. When therapeutic strategies are introduced, changes in flow of food and liquid barium as well as improvement in structural movement during the swallow can be visualized with this type of assessment. Voice Prosthesis - If a patient has the larynx and pharynx removed surgically to treat cancer and can no longer make speech, one way to enable the patient to produce a voice is to surgically create a hole in the trachea, the main windpipe with cartilage, and attach a device that can be used to replace the sound that a voice makes. Other voice prostheses include a handheld electrolarynx or a palatal vibrating device that is placed into the mouth to generate sound that the patient can modify to produce intelligible words. White Blood Cells - White blood cells are made by bone marrow and help the body fight infection and diseases. Xerostomia - Dry mouth from reduced saliva flow. X-rays - Radiation used at low levels to produce body images on film. At high levels, X-rays are used to destroy cancer cells. Nulla ultrices magna eu velit posuere, sed tincidunt tellus efficitur. Proin aliquet diam quis odio congue mattis. HANA is the new National Head and Neck Cancer Audit for England and Wales. It aims to improve the quality of services and the outcomes achieved for patients. HANA will collect and publish information about the diagnosis, management and treatment of every patient newly diagnosed with head and neck cancer, and their outcomes. The findings from HANA will contribute to changes in clinical practice ensuring that patients receive the best care possible and experience an improved quality of life. The Clinical Outcomes Publication (COP) is an NHS England initiative, managed by HQIP, to publish quality measures at the level of individual consultant, team and unit level using national clinical audit and administrative data. This is the first COP that has been published by the HANA team. It is based on data collected by the previous audit providers DAHNO and relates to patients diagnosed between 1st November 2012 and 31st October 2014. Due to limitations in the quality of the data transferred to HANA the audit will report at hospital rather then surgeon level for this period .